I use with a prorasor brush. Very good shaving cream.I shave daily and am impressed with how long this soap should last, clean smell as well. My first foray into soap ( or ‘croap’ in this case). Up until now I had been using creams (TOBS sandalwood and Proraso green in tube). I wanted a soap to rotate with my creams and I’m glad I chose this one. Using the Proraso pre and post shave beforehand has resulted in me typing this review with a face that feels like it’s been submerged in a well known brand of vapour rub. Get this when it comes back in stock guys. Great, moisturising rich lather if you take the time to build it; and a well protected smooth shave. This is a really good shave cream for the money which lathers well. When combined with the Eucalyptus and menthol pre shave cream it makes for a powerful menthol shave that will leave you feeling mightily refreshed. The skin is left smelling soapy clean and the jar will last for ages as it is quite a solid shave cream. All in all a good value cream for the money. Used all other brands. Keep returning back to proraso. Shave Lounge is an excellent company with great service and customer care. Proraso products do not work well for me personally but they do enjoy a good reputation. 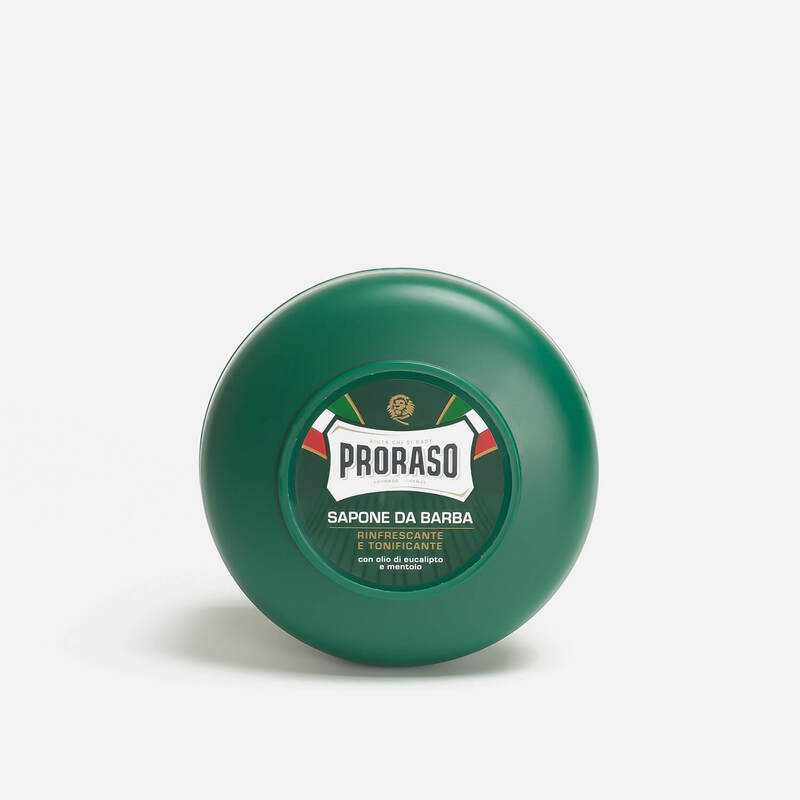 I’ve used quite a few different shaving soaps over the years, expensive and not so but I keep coming back to the Proraso brand. I think I’ve made my mind up as to what soap is best for me, why not give it a go too, it’s a great shaving soap. Simply a re-order of my favourite shaving cream which I believe to be the best. Have tried a few shaving creams, this is rich lathers very easy and smells fanstic as well. An excellent product lives up to all the great reviews. Another fantastic service and product from these folks. This soap, I would rate, along with the red, as the best soap available in its price range, by a mile. The menthol is great. Really wakes you up. I will probably use the menthol a little more in the summer. But I’ll say it again. I have all sorts of soaps and cream, some far more expensive then proraso, but it easily holds its own all day long. Its not often in life that the cheapest is the best, I have tried various soaps and creams ranging from this at £5.50 to Some Norwegian stuff at £30. Plus various soaps in between. The Norwegian stuff was lovely but lasted me around a month so was unsustainable as a long term shaving soap. The Proraso is really a cross between a soap and a cream, I lather it straight from the tub using a high quality brush and then work up the lather by swirling around on my stubble. These tubs usually last about 10-12 months and so the cost is ridiculously cheap. The aroma is great, with the minty edge that one associates with menthol and tea tree. I would urge anyone to try it – you won’t be disappointed and if you are I am sorry but hey it will have only cost you a fiver! Great easy to lather cream that gives a nice refreshing tingle when applied, smells good too and a real bargain for the price. Great smell and you don’t need much. It isn’t my favourite soap but it’s close. Lovely smell and feel and gives a good shave. If you enjoy the menthol tingle this is fantastic. I’ve been de shaving for about five months and have gone through various soaps & creams (Palmolive, ingrams etc) and decided to spend a couple of quid more on something half decent. I opted for two products. This Proraso and Cella. All in all it’s a very good soap and easy to lather although I do sometimes get variable results. I’m putting this down to my technique slipping rather than the product as I get occasional mess ups with Cella too. The Proraso has a pleasant aroma which isn’t too clingy so as to spoil your aftershave and it does leave the skin feeling refreshed. Definitely one for the summer! And I will be buying it again! This menthol cream gives an experience that took me completely by surprise. It lathers and lubricates very well, it does everything that it says it will, but it is the menthol it contains that gave me the surprise, it gives a cool feel to the face. A good cream which gives a really different shaving experience.